Carhartt is a brand and retailer of durable work clothing and accessories, based out of Dearborn, Michigan, United States. The privately held company sells its products through their own chain of Carhartt stores across the country, as well as other select retailers. You can also shop online at Carhartt.com. Products range from coveralls to thermals, and there are ranges for both men, women and children. What makes the website so appealing is the number of offers and deals available. These are redeemed by using Carhartt coupons, which are special codes that you can enter during the online checkout. We collect all the latest coupons here at Coupofy, so check back before ordering to ensure you make savings. We also have Carhartt printable coupons if you prefer to shop in store. Carhartt was founded in 1889 by Hamilton Carhartt and a small team of sewing staff, that provided the local railroad workers with practical and comfortable clothing. Today the company makes hundreds of millions in revenue, has upwards of 4,000 employees, with operations in the US, Canada and Europe. Although Carhartt mainly focuses on durable work clothing this is not restricted to men, as they include ranges for women and children as well. The site also has specific categories for Flame-Resistant clothing, Accessories, their own Brands/Collections, and Clearance items where you can find some bargains. Types of clothing include Overalls & Coveralls, Outerwear like Hoodies & Jackets, T-Shirts, Long Sleeved Tops, Pants & Shorts, Thermal Clothing & Underwear, High Visibility, Hospital style Scrubs, and Footwear. This includes a wide variety of Boots, such as Safety Toe, Regular, Rugged Flex, CSA Certified, Steel Toe, Puncture Resistant, Electrical Hazard, Waterproof, Storm Defender, and many others. Accessories available cover Hats & Headwear, Socks, Gloves, Belts, Wallets, Bags, Safety Goggles & Glasses, Storage, Knives, Hand Soap, and much more. The Children's range is a lot more casual but still includes some rugged outerwear. You can also buy gift cards which can be delivered by mail or electronically, allowing the recipient to make their own purchasing choices. You can browse the inventory using the above categories or use the search bar if you have something specific in mind. Carhartt.com accepts Paypal as a method of payment, as well as most common credit cards, such as MasterCard, Discover, Visa, and American Express. You can also use their own branded gift cards for all or part of your order, the rest of which will have to be paid by credit card. If you do not wish to make your order online you can always call customer service and place the order by card by phone. To redeem a Carhartt coupon code all you need to do is select the one you want on Coupofy, click the link to reveal the code and then copy it over to the store's website. Simply paste it in to the promo box during checkout, which you'll see before payment. 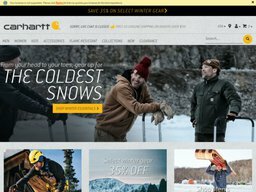 Carhartt.com currently only serves US and Canadian customers, including non-continental states and APO & FPO addresses. Standard Ground shipping starts at $6.25 for orders valued up to $25 and reaches $9.25 for orders over $200. Delivery will take up to 7 business days in the 48 contiguous states. You can also pay extra for faster options, including 3 Day *starting at $8), 2 Day (starting at $11), and Next Day (starting at $20). APO and FPO addresses are restricted to a single $7.95 option, Canadian shipping starts at $16, and Hawaii & Alaska are restricted to 2nd Day and Next Day options only, starting at $22 and $31 respectively. From time to time they also offer free shipping through the redemption of a Carhartt coupon code. Note if you have used any Carhartt promo codes to get a discount, you will obviously only be refunded the actual amount charged to your payment method.